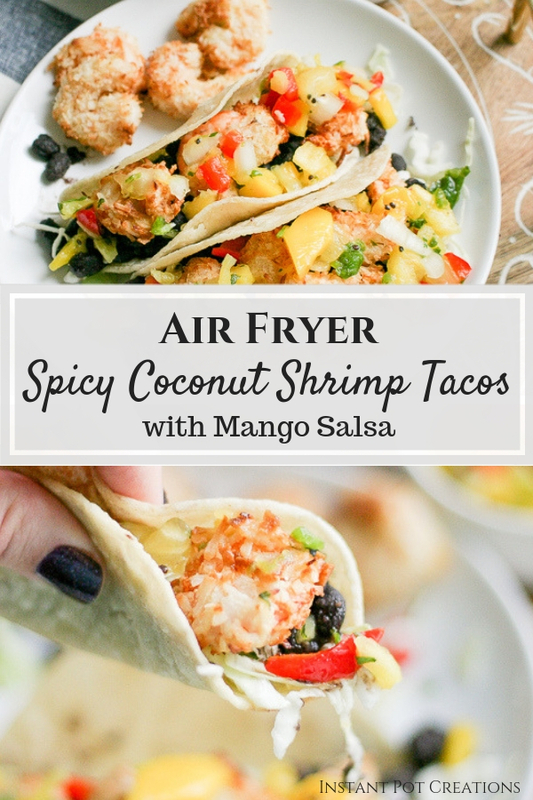 Air Fryer Spicy Coconut Shrimp Tacos - Jenuine Home - Interior design, decor, diy for your home and Instant Pot Creations for your tummy. Oh man, using an air fryer to make spicy coconut shrimp is THE reason to own one. I just could never get coconut shrimp crispy in an oven before. The top would be nice and crispy but the bottom would be soggy and often left it’s breaded bottom behind in the pan. This won’t happen in the air fryer! The air fryer creates amazing crispy edges all around without losing the delicious coconut breaded bottoms! I was first introduced to the paleo air fryer coconut shrimp method from my friend, Dr. Karen S. Lee’s new book, Paleo Cooking with your Air Fryer. She created an air fryer Coconut Shrimp recipe that she shared in her new book and also on her website. Her Coconut Shrimp looks so amazing, including the Tropical Dipping Sauce recipe. 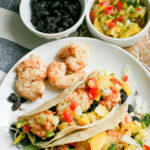 Using her genius idea of dipping the shrimp into Cassava flour to make it paleo and gluten free, I adapted it to create my own recipe for spicy, sweet and salty air fryer coconut shrimp tacos. 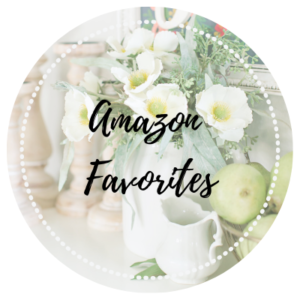 I recommend purchasing Dr. Karen S. Lee’s Paleo Cooking with your Air Fryer, which includes all sorts of amazing air fried goodness from veggies, meats to desserts and sauces! I’m excited to cook my way through her book because let’s be honest, I LOVE crispy edges. Set 3 large plates on the counter. Place cassava flour on one plate, shredded coconut on another and leave the last one empty. Whisk eggs in a bowl. Place bowl between flour and coconut. Place shrimp in flour and coat all sides. Dip in eggs. Then place shrimp in coconut and coat all sides. Place shrimp on large empty plate until ready to cook or right into air fryer basket that has been lightly greased with avocado oil spray. Sprinkle coleslaw in bottom of taco. Add 1 tbsp of black beans on top of coleslaw. These Instant Pot black beans are amazing in the tacos. Place 3 shrimp in tacos. Spread mango salsa across the top from edge to edge. Add cooked riced cauliflower or cooked sweet potato cubes to coleslaw, shrimp and salsa. 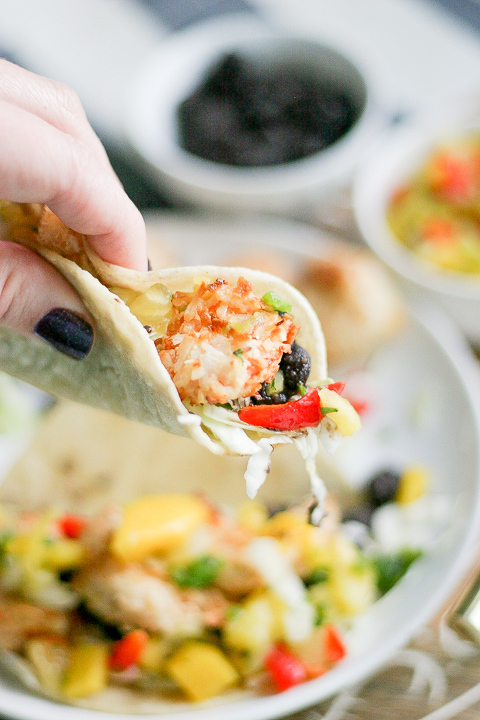 It’s so easy to make your own taco shells and they taste so much better than store bought shells. Create your own corn tortilla shells by lightly spraying a tortilla on both sides with avocado oil. 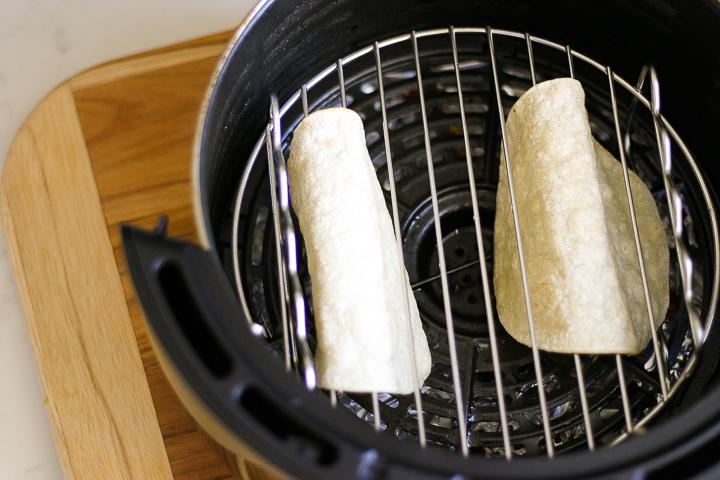 Place two tortillas on wire rack in air fryer as shown above, making sure 2-3 grill bars are in the middle of the tortilla between the edges so that they cook open. Cook for 2-3 minutes at 370 F in the air fryer. Remove from air fryer and let cool on a plate. It will continue to harden and crisp up as it cools. 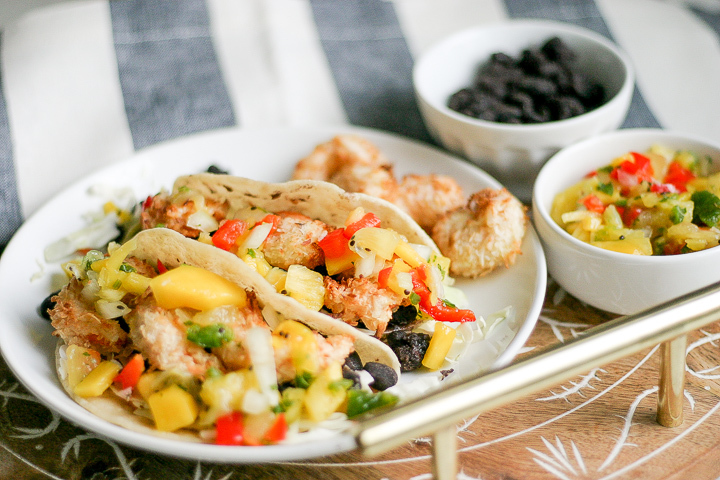 This tropical mango salsa is the perfect fit for air fryer spicy coconut shrimp tacos. Sweet, spicy and salty is one of my favorite flavor combinations. Feel free to just make the salsa on it’s own to snack on anytime with chips. Have you ever tried mango salsa on nachos before? I think it’s about time you tried. We have a hard time not eating all of this salsa as we are dipping and prepping the shrimp for the air fryer! Coconut Shrimp with just enough spice to make it have a little kick, yet mild enough for the whole family. Air Fry the shrimp to give them the perfect crisp without any deep frying! 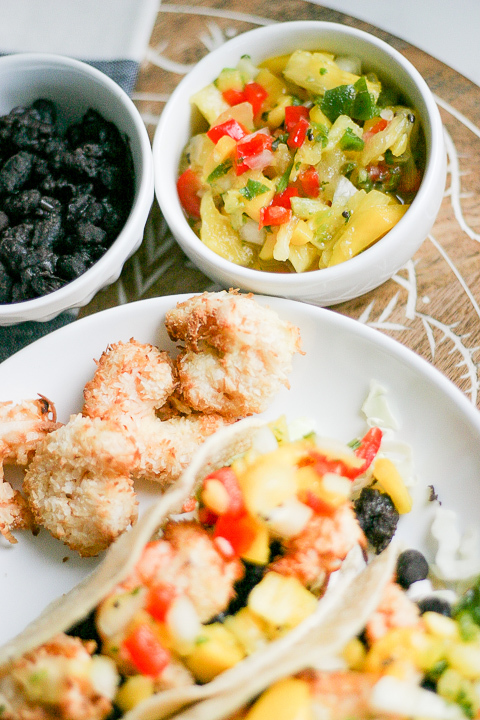 Paired with mango pineapple salsa and black beans, and you'll have a happy tummy. To make this recipe Paleo, omit the corn taco shells and eat on a bed of coleslaw salad. If using frozen shrimp, make sure they're properly thawed. tails removed and deveined. Place shrimp in a bowl. Add paprika, salt, cayenne pepper and juice of 1 lime. Stir to combine. Place bowl in the fridge and marinate for 30 minutes (or overnight). Start on the salsa while the shrimp marinates. For the salsa, chop up all fruit/veggies with a knife or use a food processor. In a large bowl, combine pineapple, mango, red bell pepper, onion, jalapeno, cilantro, lime juice and add salt to taste. Mix well. Set aside. Spray air fryer basket and rack with non stick spray. Put the cassava flour on a plate and the shredded coconut on another separate plate. Whisk the eggs in a small bowl and place bowl between flour and coconut. This will be your dipping line up. Start by dipping a piece of shrimp in the flour, coating on all sides. Then dip the flour coated shrimp into the eggs. Then place shrimp in the coconut and flip until coated. Place dredged shrimp on a clean plate until ready to cook or start placing into the air fryer basket. Once the air fryer basket is full with a single layer on bottom rack and top rack (if your model has a top rack), cook for 5 minutes at 370 F. Take basket out, flip shrimp and continue cooking for another 2-3 minutes or until desired golden, crispy exterior. While each batch of shrimp is cooking, continue to repeat the dipping process with all remaining shrimp. After shrimp is done, it's time to prep the tortilla shells. Place corn tortilla in hand and lightly spray with avocado oil on each side. 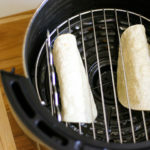 Place tortilla on Air Fryer rack between the metal grill with edges hanging down. Cook for 370 F for 2-3 minutes. Remove with tongs onto a plate. It will continue to harden as it cools. Repeat with remaining tortillas. To assemble the tacos, place coleslaw and black beans in taco. Place 3 shrimp on top and add mango salsa evenly across the taco. 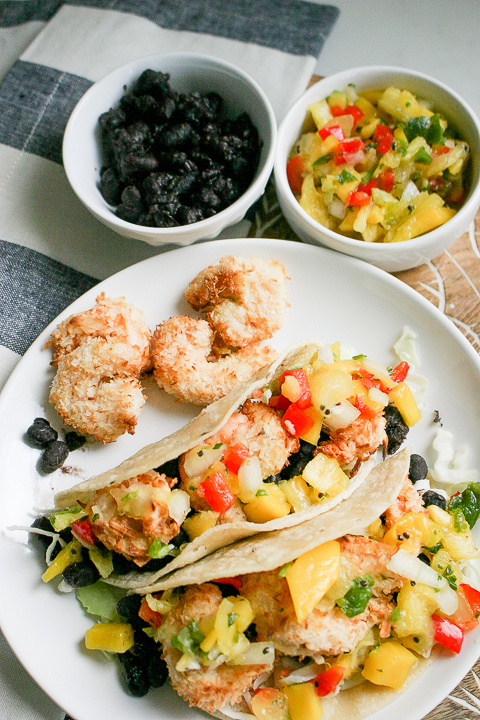 Enjoy the sweet, salty and spicy coconut shrimp tacos!